This is more of an amusement-educational design rather than a puzzle.This 4 pieces are identical and make many deferent shapes I have some designs that refer to classrooms for educational purposes and this is one of them. 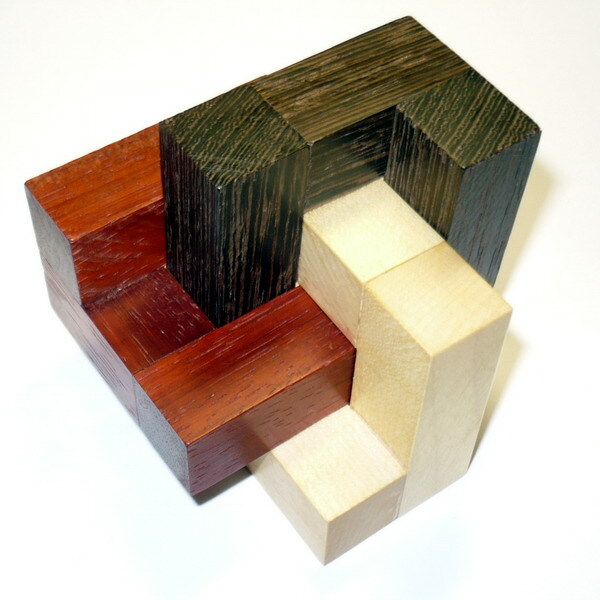 The design on the picture is with 3 pieces,it is very beautiful(my favorite shape) and surely i am going to make a puzzle in the future even if its easy.Believe it or not it takes some minutes to understand how the pieces go to form that shape If it was one color wood you would see that it is an endless looop!!! the 3 colors are only for beauty purposes. ENJOY!!! See more pics of the "4u" puzzle.or Back to puzzle index.